Pocket Sled kites are a great introduction to kite fishing. These kites are frameless soft kites that are somewhere between parafoil kites and a parachute kite. They are suitable for towing one to five hooks well offshore and perform best on line weights of 8 to 15kg breaking strain. They are a great introduction to kite fishing. The kites have tapered pockets and a tapered body to give a ram air effect. Each kite is supplied with it's own flying bridle and drogue kite tail. This two kite pack will give more fishing opportunities over a wider wind range and also the option of running a two kite dropper rig in most winds. 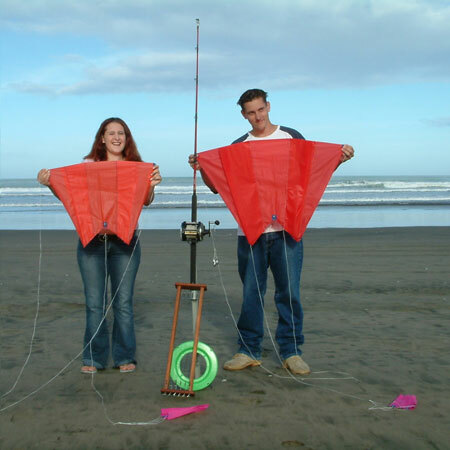 The larger sled kite can be used on the outside of the rig and the small kite can be clipped to the mainline in order to support it clear of the water for further distance offshore. Alternatively, use the large pocket sled kite for light to moderate winds, and the small pocket sled kite for moderate to strong winds. If you already have a fishing rod and reel these soft kites will get you casting as far offshore as your reel cappacity allows. Casts beyond 500 metres are the norm with this kite set. 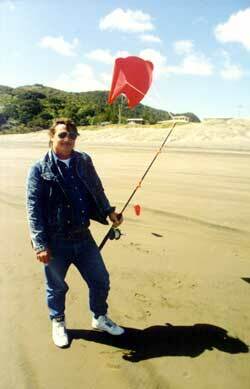 These kites are downwind kites only and are difficult to tack more than 15 degrees while maintaining stability. Productive fishing is possible with these kites if the wind is more than 45 degrees offshore and blowing between 7 and 30 knots. If you need a fishing kite that will perform in a wider wind range and/or a much more tackable kite, check out the Flexiwing Delta Kite. Try the Two Kite Pocket Sled Pack for the ultimate cast in offshore winds. The large kite only or small kite only can be bought separately.